When you teach your dog to speak, you are not giving him permission to bark at every sound he hears or every moving object he sees. You are teaching him to give a few short barks and only when you ask him to. To get your dog to bark, make the most of situations that already cause him to bark. For example, if he barks when the doorbell is rung, say 'speak' and offer him a treat. The key to turning this into the 'speak' trick and not a prolonged bout of barking at the door is to give him the verbal command as soon as the bell is rung. Do not reward him in any way if he continues to bark once rewarded. If this situation normally causes your dog to start a frenzied run around the house, put him on a leash to control his behaviour and focus his attention. Once you get one or two barks, give a treat and praise. Another way to get your dog to speak is to show him a treat and get him really excited. Most dogs will bark if you take your time and withhold the treat. Practise a few times with a treat and then practise a few more times without the treat. A third way to get your dog to speak is to find an activity that gets your dog wound up and barking. Once he starts barking, say 'speak', and then reward him by playing the game that got him so excited. No matter the activity you use to teach your dog to speak, your dog will eventually not need the activity, but will be able to associate the verbal command with the required action on his part. A word of caution: if your dog is a problematic barker, you may not want to teach him this trick as it may actually encourage his barking. However, if you do go ahead with this trick, ensure to teach him 'quiet' to end the trick. 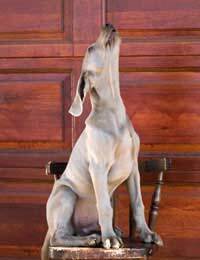 Some dogs 'sing' when they hear high notes or strange sounds. If they do this, teaching them to do it on command requires the trigger sound and the 'sing' command. The trick is taught the same way as 'speak' - verbalise the command as soon as your dog begins to sing, then praise and reward. There are some dogs that do not sing. Before thinking you don't have a songstress in your family, introduce a whole bunch of new sounds into the house to see if your dog will react. If when all sounds are exhausted there is no singing, your dog may not be a singer. Unfortunately, this is not a trick you can get a dog to learn as it depends on the dog's initial reaction to a sound.